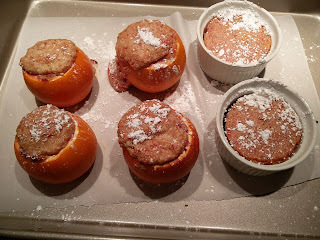 Tonight, we also made some blood orange souffles. 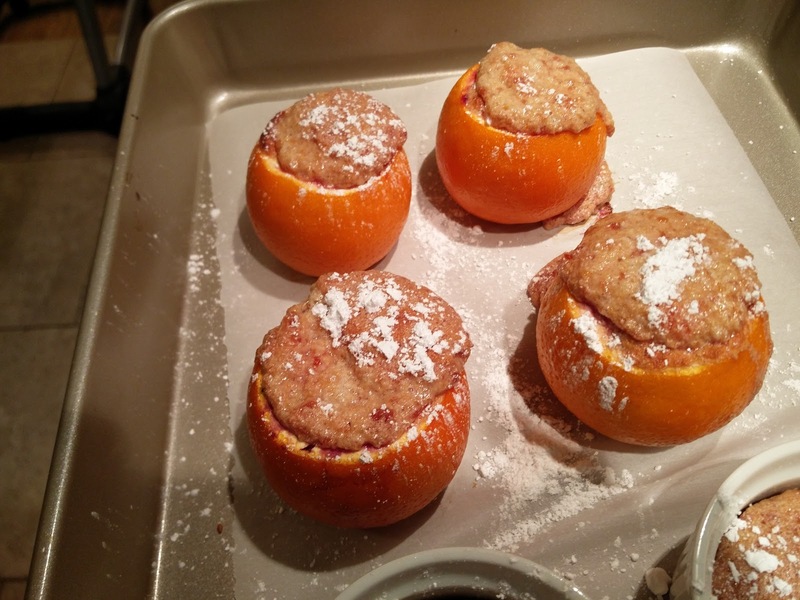 The intent was to only make 8 oranges and half the recipe. However, we forgot we were doing that and ended up making the whole thing. Luckily, the only thing required from inside the blood oranges is the orange juice, and there was more than enough orange juice from 4 oranges to make probably at least two batches of the recipe. The downside, is that only 4 of the beautiful orange "bowls" were available, but it was still really good! Also, we were not able to find any blood orange marmalade, so we substituted Seville Orange marmalade from Trader Joe's instead. 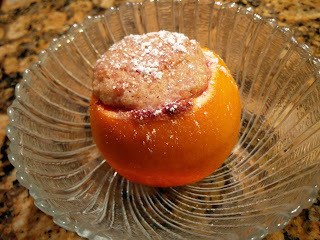 Surprisingly, these were relatively easy to make and a wonderful light desert! We made these about 40 minutes ahead before putting it into the oven. 3. 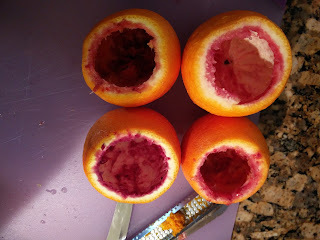 Slice 1 inch off the tops to expose the fruit. 4. Using a superfine citrus zester, such as a Microplane, grate 1/2 teaspoon of zest from the tops and reserve; discard the remaining tops. 5. Using a sharp paring knife or grapefruit spoon, scoop out the fruit into a medium bowl. We found that using a spoon actually works best and gets the orange pieces out most "wholly". 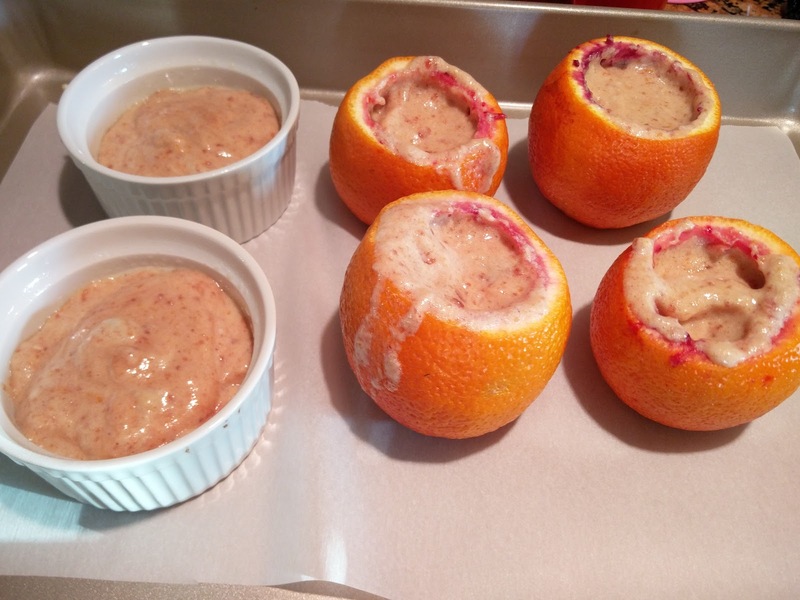 Hollow out the oranges, being careful not to pierce through the skin and collecting all the juice in the bowl. 6. Arrange the orange shells on the prepared baking sheet. 7. Squeeze the juice from the fruit and strain into a bowl. We used a NutriBullet to mush up the fruit and then strained it to get the juice. 8. 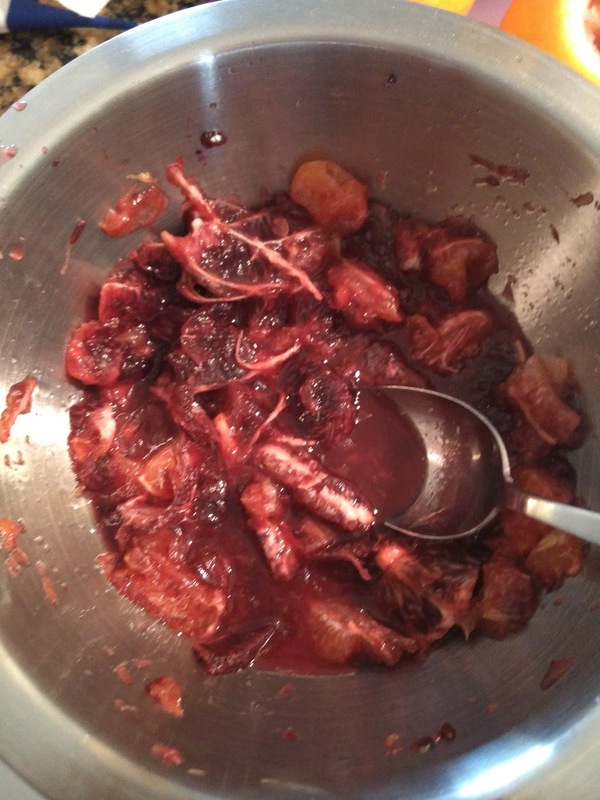 Transfer 1/2 cup of the juice to a medium saucepan; reserve the rest for another use. You can throw away the pulp. 9. Add 2 tablespoons of the granulated sugar to the saucepan and bring to a simmer over moderate heat; cook until the sugar is dissolved. 10. Meanwhile, in a medium bowl, whisk the egg yolks with the remaining 2 tablespoons of granulated sugar and the cornstarch until smooth. 11. Whisking constantly, slowly drizzle in the hot orange juice. 12. Add the mixture to the saucepan and cook over moderately low heat, whisking constantly, until thickened to a pudding consistency, about 1 minute. 13. Whisk in the reserved 1/2 teaspoon of grated zest and the marmalade. Scrape the mixture into a medium bowl and let cool until lukewarm, about 30 minutes. If you put into a shallower, glass bowl and spread it out, it will cool much faster than the recommended 30 minutes. 14. In a medium bowl, beat the egg whites with a hand mixer at medium speed until soft peaks form. 15. 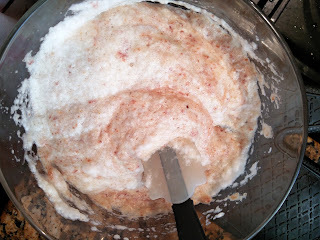 Fold the whites into the cooled orange mixture until well blended. 16. Spoon the filling into the orange shells, leaving 1/4 inch at the top. Run the tip of a sharp paring knife just around the inner rim of the oranges to help the soufflés rise evenly. 17. Bake for 12 to 13 minutes, until the soufflés are risen and golden on top. 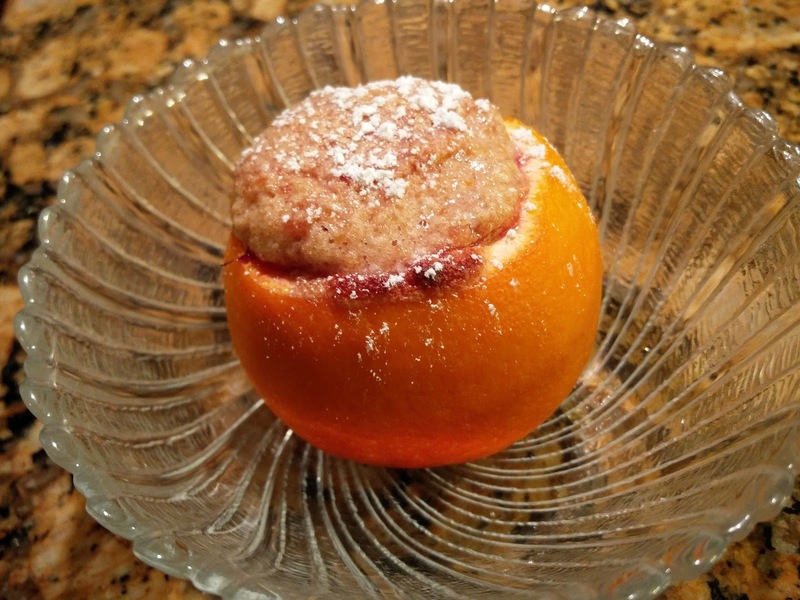 Transfer to serving plates, dust with confectioners’ sugar and serve immediately. The souffles can be prepared through Step 6 and kept at room temperature for 1 hour before baking. Very light and airy. It was a very unique experience in the orange. It seems like a party dish, but it would be hard to do for a large amount of people as these are best warm. A little too sweet for Nick. Alona thought it was good. He said it looked "gross". He normally loves oranges, but not a fan of sticky things. He seems to be more on a chocolate kick these days. Bigger oranges! That would make it easier to scoop out and get the souffles in. Maybe not fill it so high either.